New one-off private house, South Dublin. 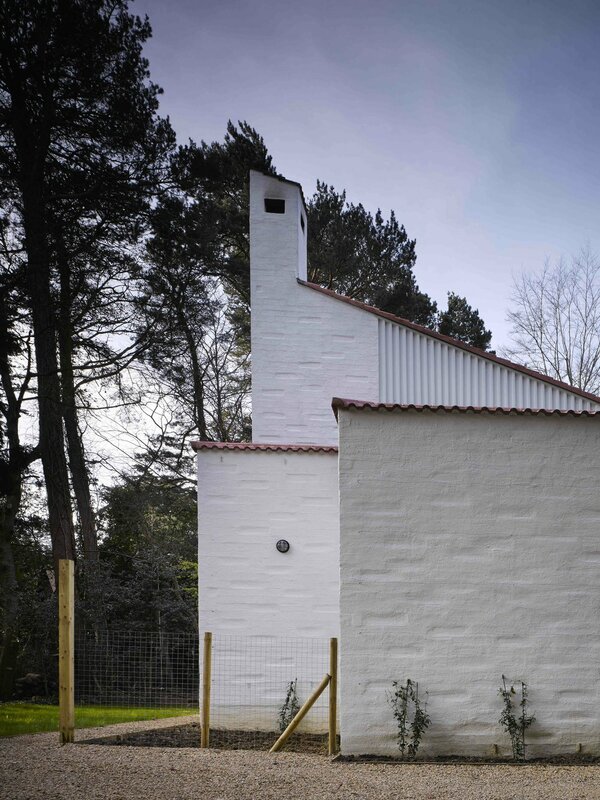 Surrounded by mature Scots Pine, Sycamore and Cypress trees, the brief was for an intimate family home respectful of its immediate neighbour, a handsome Arts and Crafts house, the wider Architectural Conservation Area, and the sylvan landscape setting. The suburb boasts a vibrant mix of architectural styles and the new house employs a material palette which is sympathetic to the character of the neighbouring houses, but also confidently modern. The composition of the windows to each elevation is driven by a close attention to environment and sustainability with minimal windows facing north and the road for both thermal performance and privacy. The bedrooms face east for the morning sun. The living spaces are gathered to face east and south, away from the neighbours and towards the garden and the surrounding trees which are within touching distance. The necessary proximity of the house to the trees, called for the house to be raised up on mini piles to allow the roots of the mature trees to continue under the building. The walls are purposefully imperfect, white painted lightly rendered soap bar blocks are gently knocked out in a pattern which softens the overall solid mass of the house. At first floor level, the painted vertical timber cladding around the openings further breaks up the massing. The front elevation is held and articulated with a chimney at its peak. A mono pitch roof, finished with terracotta roof tiles, responding to the rosemary tiles of the neighbour, springs from the west and reaches up to the tree canopy to the east.